Ptolemaic Kingdom. Ptolemy II, 285-246 BC. AE 28. 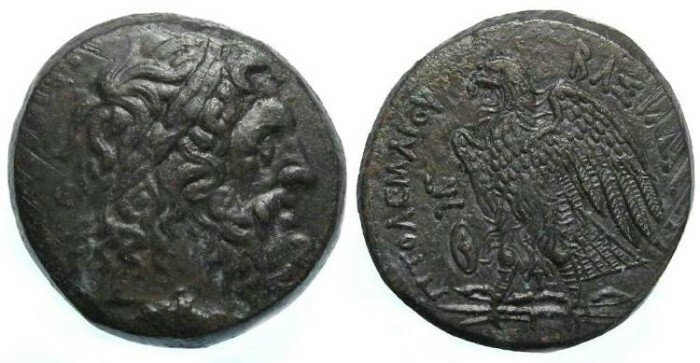 Reference : Sear Greek-7779. Svoronos-553. Size : 26.5 x 27.9 mm. Weight : 16.20 grams. Grade : XF. Very dark brown patination. The obverse had more detail than the image suggests. Reverse : Eagle standing left with wings spread, on a thunderbolt, with a small shield below a MG monogram in the left field, and PTOLEMAIOY BASILEWS around. There are a number of what appear to be file marks along the edges of the obverse and reverse. These are marks that were on the flan prior to the coin being struck, most likely in an attept to flaten the flan a little before striking to make it easier to strike. They are the equivalent to the circular lathing marks seen on later issues, although this coin pre-dates the lathing process.